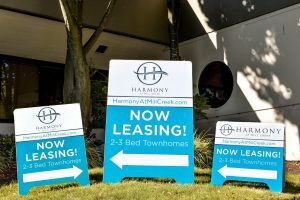 Portable signs consist of signs that do not have a permanent attachment to the ground or any structure, allowing them to easily be moved at any time. Such signs include A-frames, chalkboard and whiteboard signs, flag signs, banners, yard signs, etc. They have been useful tools in advertising for more than a century and are still considered a worthwhile investment until now. 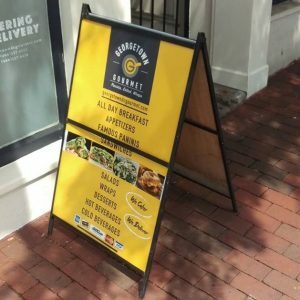 Black Parrot Sign Studio is a trusted local signs provider that specializes in producing sturdy, custom-made portable signs with strategic and impactful content. We have partnered with numerous businesses and we’ve successfully provided them with effective long-lasting, portable signs suited to meet their needs, locations, and budgets. Promoting your business isn’t always done on site. Sometimes you have opportunities to display your brand at tradeshows, conventions, or even community events. Black Parrot Sign Studio ensures you have the right portable signage to speak to your audience. We create complete custom displays, indoor and outdoor banners, flag signs, yard signs, real estate signs, and even custom vehicle graphics and magnets to take your marketing on the road. Black Parrot Sign Studio also offers portable signs fit to catch attention and promote brands in smaller areas such as sidewalks. 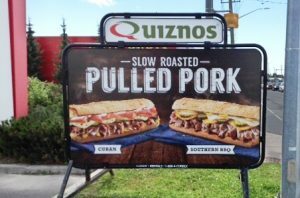 Our sandwich sign options put the “portable” in portable signs. They are small, light, and compact enough to move around and store easily, but are also durable enough to withstand everyday outdoor elements. A-frame signs by Black Parrot Sign Studio also offer some flexibility. Some models are made with high-quality hard plastic and can be kept in place more firmly by filling up the frames with sand or water. When you’re done using the sign, you can simply pour the sand or water out and proceed to storage. At Black Parrot Sign Studio, we have a wide selection of portable signs that you can choose from. We want to give you the signage that best suits your business…whether it’s something as light as a pop-up A-frame sign made of water-repellant fabric, or something as heavy-duty as steel-framed marquee sign with ballasts. Black Parrot Sign Studio has been an established signs provider for a long time, and this is largely because we’re committed to giving our clients the signs that meet marketing demands as well as legal ones. At Black Parrot Sign Studio, we protect our clients from possible noncompliance and violations by staying informed of the bylaws and manufacturing custom portable signs that meet them. We can also offer you our knowledge and advice as you secure permits and submit requirements. Black Parrot Sign Studio knows the ins and outs of portable signs because we’ve been in this business for years! 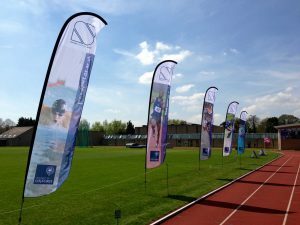 We are the ideal choice for something as vital and challenging as portable signs. Do you want to know more about portable sign design, materials, installation, and regulations? Our team of marketing experts, engineers, and signage specialists are here to help. Call Black Parrot Sign Studio today at (714) 406-0939 for your Free Consultation with a Portable Signs Expert!